Can you create a delicious/fun sculpture out of items from the produce aisle, including chokies? Start dreaming. Can you create a delicious/fun sculpture out of items from the produce aisle, including chokies? Start dreaming: The Castroville Artichoke Food & Wine Festival returns to Monterey over the first weekend of June 2019. CASTROVILLE ARTICHOKE FOOD & WINE FESTIVAL: No doubt about it, some of the traditional artichoke questions may be asked of you (like, what dip?) while you visit the early June celebration. 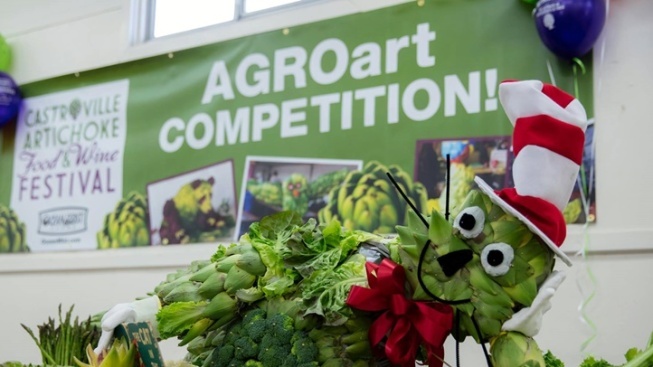 But you'll need to get very creative should you enter the Agro Art competition, which involves making interesting sculptures out of vegetables and fruits. Yep, incorporating artichokes is a stellar idea, and Ocean Mist, the company behind the fun showdown, will provide some. But that's "first come, first served," so do feel free to arrive with the produce you intend to use to create your most splendid, food-based sculpture. OTHER HAPPENINGS... at the Monterey-based festival, a perennial stand-out on the Golden State food festival calendar? Chef demonstrations, chances to snack upon succulent chokie goodness, and the super-in-demand field tours, which can fill up. Need our tickets and your art inspo? June is still a pinch away, but artichoke love is always close to the heart. Begin here.